After recently having traveled and tried a host of new places, I was ready to go back to my favorite haunts in LA and appreciate the familiar. 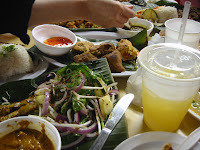 Naturally, we headed to Singapore's Banana Leaf at the Original Farmers' Market. The food is an eclectic mix of Singaporean, Malaysian and Indian and I can't get enough of it. 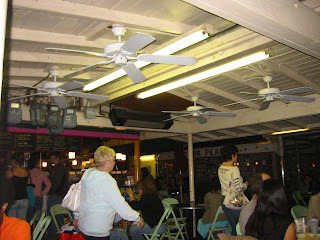 The outdoor food court gets pretty crazy and often cold at nights, but it's hard to beat the value and spice at this tucked-away joint. On this particular night, we had fish curry, which is my personal favorite, mee goreng (stir-fried noodles with vegetables and tofu), nasi goreng (fried rice with vegetables and chicken), beef rendang, which the menu describes as "spicy coconut, chili, ginger chicken or beef served with rice & cucumber pickle," and is usually my second favorite except this night, it lacked spice unlike most of the times we've asked for spicy (it was a busy night), spring rolls, samosas, roti paratha and chicken satay. 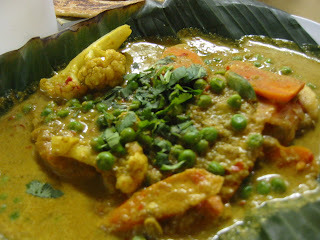 The fish curry (above) was just spicy enough and the green peas, carrots and cauliflower were cooked just right and the cilantro sprinkled on top gave the sauce a very fresh flavor. 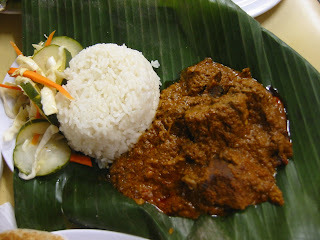 We usually ask to make the beef rendang (left) spicy, but it wasn't this time and disappointed. When it is spicy, though, it goes so well with white rice and has a very complex flavor -- a hint of ginger here, chili there. Wonderful. The appetizers are almost more impressive than the main dishes. I'm sure it's got loads of butter and not good for you, but the decadently crispy and fluffy roti paratha dipped in the all-too salty curry sauce was extremely satisfying. Tearing apart this Indian bread reminded me of croissants, as they have similar textures. 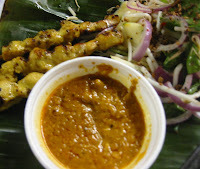 I've only had the chicken satay and both the meat and sauce were good. The only complaint I had is that the meat could be more thinly sliced so it wouldn't so hard to get it off the skewer and less filling! 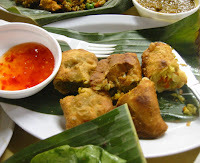 The samosas were perfectly crunchy and almost creamy on the inside with an amalgam of potatoes, peas and spices. The spring rolls were an afterthought -- not particularly memorable. I wouldn't order this unless you generally love spring rolls. Now on to the rice and noodles. 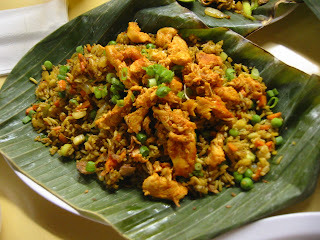 The rice dish, nasi goreng, is a classic Indonesian dish that I remember fondly from my days traveling in Bali. 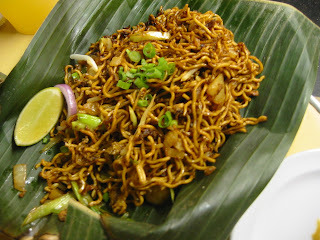 Likewise, the noodle dish, mee goreng, is a standard Indonesian dish I recall eating quite a bit of when I was there. My favorite part being the fried egg on top, I asked for it but didn't get it this time due to the busyness. You can usually get the egg without asking if you order the set combo that comes with a smaller portion of the noodles or rice and 2 satay sticks. The noodles were ok but on the dry side. I wanted a bit more moisture and I think the runny goodness of a fried egg may have accomplished that. Sigh. The rice was probably my least favorite. It was dry, dry, dry, and the dry chicken strips on top didn't help. Even though we didn't on this particular night, we've also had the Rojak Salad, which comes with cucumber, jicama, pineapple, bean sprouts, apple, tofu, and spinach, tossed with a spicy peanut tamarind dressing. Refreshing and healthy, but it didn't serve our purpose of going for comfort food. 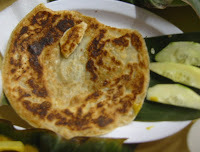 Wash it down with an ice-cold mango juice, grab a table amid the busy foot traffic browsing the food stands and dig in. Welcome home. thanks, anonymous, for your first comment! could you be someone who may call this restaurant singapore's coconut leaf?